KNIGHTS TEMPLAR TOLEDO COMMANDERY SILVER PIN 19TH C.
Beautiful 1950's amethyst rhinestone set brooch. This brooch is in fine condition and measures 1 5/8" x 1 1/8". 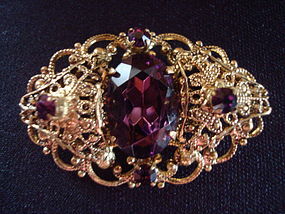 It has a large center faceted amethyst pronged rhinestone flanked by four smaller faceted pronged rhinestones set in a gold toned filigree pin. A real eye cacher!!! Fabulous 1950's jeweled rhinestone and enamel ladies brooch. 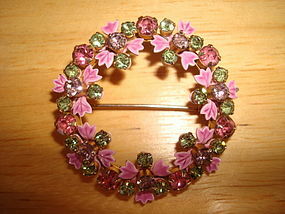 This vintage pin is in fine condition and it is in the form of a wreath of flowers that consist of 3 color set rhinestone and petals of enamel. It measures 1 1/2" in diameter. Most of the enamel flower petals are in excellent condition, a few have some enamel loss but this is hardly noticeable. 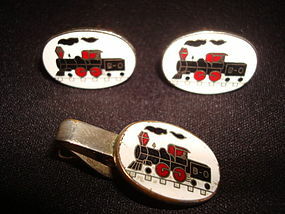 As seen in the pictures, this pin really sparkles and is sure to be noticed!!! 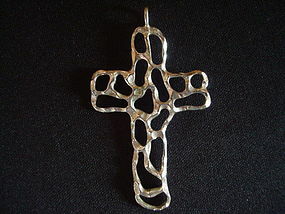 Fantastic abstract sculptured silver cross. This vintage sterling cross was made somewhere between the 1950's and 60's and is signed STERLING and with the famous arrow with CA logo of the CARL ART Jewelry Company of Providence Rhode Island. Carl Art operated between 1936-1976. 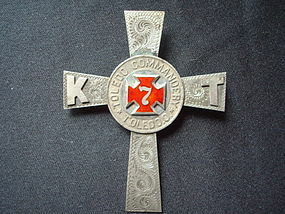 This cross is in very fine condition and measures 2 1/2" in height and 1 7/16" wide. A most unique example of a Christian Cross and a real piece of wearable art!!! 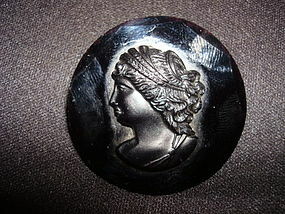 Nice early 1900's black amethyst glass cameo mounted on a metal backing. This vintage pin is in nice condition and measures 1 1/2" in diameter. It features a raised cameo bust mounted on a circular background that has a faceted rim. 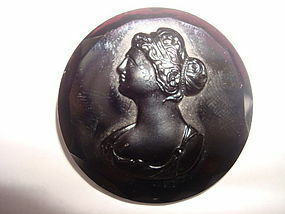 This cameo is made of black amethyst glass and is attached to a metal back with an early style pin clasp. 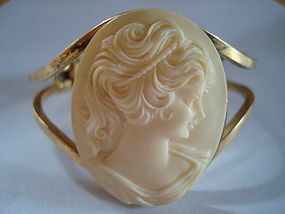 A nice early 20th Century Cameo!!! Early 1900's black glass pin that is signed CZECHOSLOVAKIA in back. This pin is in nice condition and measures 1 1/2" in diameter. It features a raised cameo set on a brown base with a faceted rim and it is completely made of black amethyst glass. 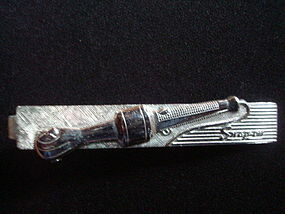 It has the old style pin clasp. A nice early 20th Century Cameo!! Nice 1960's glass brooch. This vintage brooch features a root beer colored cameo bust laid on a white glass background with etching. 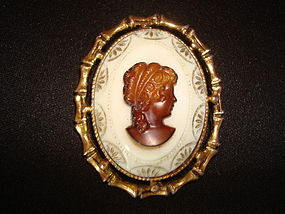 This cameo is in fine condition and measures 2" long and 2 5/8" wide. 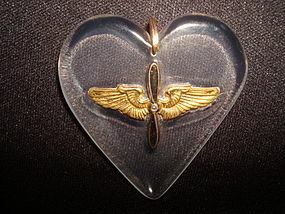 World War 11 era ladies lucite pendant with wings and propeller. 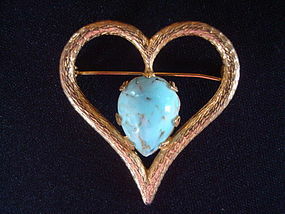 This is a piece that is known as SWEETHEART JEWELRY, given by a Military man to his loved one. This piece is in fine condition and measures 1 3/4" high and 1 3/4" wide. 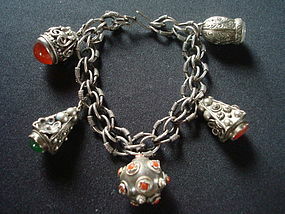 Beautiful and very interesting gypsy craftsman made bracelet. This bracelet is from about the 1930's and is silver. 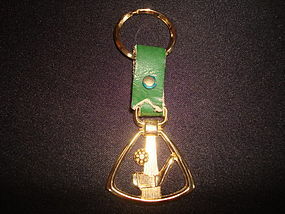 It is marked either 838 or 888 on its clasp hook. It has 5 amulets and each have set semi precious stones!!! 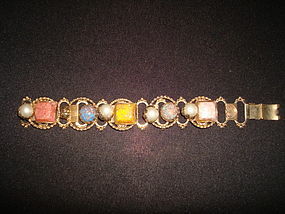 This bracelet is in Wonderful condition and is 7 7/8" long. This bracelet is sure to draw attention and is quite unique!!! 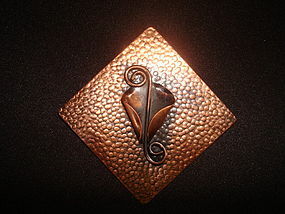 Wonderful 3 piece vintage copper jewelry group. 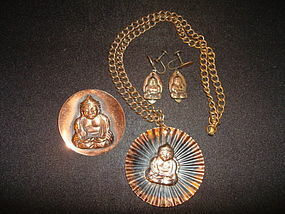 These 1950's pieces include a medallion with its original chain, brooch and earrings that each feature the image of Buddha. They are all in very nice condition. 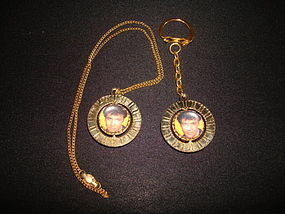 The medallion is 2 1/4" in diameter, the brooch is 1 7/8" in diameter and the earrings are each 1 1/2" long. These 3 pieces when worn as a group will surely draw attention from many admirers!! !